February 2, 2015 May 6, 2016 - by marc - 3 Comments. If you are reading this blog, there are chances you are using computers, tablets, smartphones and many other electronic devices to do your job, play games, and carry on various sort of activities. Among those activities, there are chances you come up with ideas, information or data you want to keep. The ideal tool for this is OneNote. Yes, there are other alternatives, but since Microsoft is now giving OneNote for free for almost all platforms, including Apple and Android, you may want to give it a try: OneNote.com. You may want to read more about what you can do with OneNote by reading the OneNote blog. I’ll go over in future posts on simple tips and tricks that will help you squeeze the juice from this application. However, for whatever you’ll use OneNote, the first critical thing to do is to keep OneNote sync on all your devices. If you do this, when you update OneNote on your phone, your PC, Mac and tablets will be updated too automatically! The same goes in every possible direction. 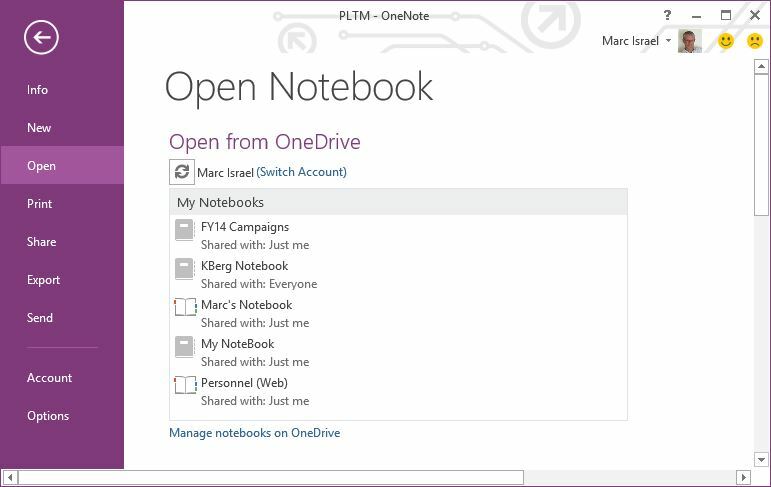 When creating your OneNote Notebook (File, New), chose your OneDrive share. Invite other people, or not, if you want to collaborate with peers. Note this is not mandatory. If you chose to do so, others PC/Mac/Tablets/Phone will be kept in sync as well – a great way to create a document on which all can contribute. On your other devices, open the Notebook you have just created (File, Open) by going to OneDrive and chose the right Notebook. Voilà, as simple as that. Now your Notebooks are synchronized and you can start taking notes, without risking losing them. They will be with you anywhere, anytime, on any device (sounds familiar, doesn’t it?). Hi, how does OneNote sync? Is the complete notebook synced all the time, or is it changes only? Hi Nico, only changes are synced, once initial sync is done.